As summer in Glacier National Park progresses some of the flowers that were plentiful in the spring and early summer give way to a host of late blooming varieties. One of the most colorful of these is the Fireweed. 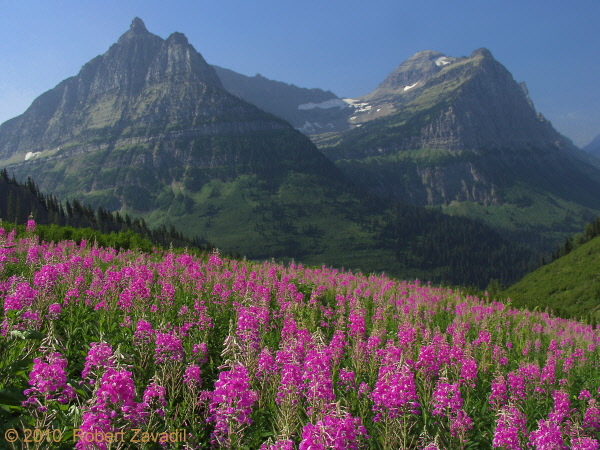 Named for its habit of rapidly populating areas previously burned by forest fires, fireweed can be found at many locations along the Going-to-the-Sun road in Glacier National Park. In this picture a dense stand of this spectacular colored flower is seen with the peaks forming the Birdwoman cirque in the background.